BELLINGHAM, Washington, USA, and CARDIFF, UK — Dental caries– tooth decay — is the most prevalent dental disease among children and adults around the world. Left too long before treatment, the disease results in difficulty eating, infection, and even tooth loss. New research published by SPIE, the international society for optics and photonics, in the Journal of Biomedical Optics describes a method enabling much earlier detection using inexpensive long-wavelength infrared imaging. A cavity begins with a minute amount of mineral loss from the tooth enamel surface, resulting from the acidic environment of dental plaques. If caries can be detected early enough, the progression can be stopped or even reversed. Dentists currently rely on two methods to detect early caries: x-ray imaging and visual inspection of the tooth surface. But both of these diagnostics have limitations: dentists can't see caries until it is relatively advanced, and x-rays can't detect occlusal early caries — those on the biting surface of the tooth. In "First step toward translation of thermophotonic lock-in imaging to dentistry as an early caries detection technology," Ashkan Ojaghi, Artur Parkhimchyk, and Nima Tabatabaei of York University in Toronto describe a low-cost thermophotonic lock-in imaging (TPLI) imaging tool that would allow dentists to detect developing caries much earlier than x-rays or visual analysis. 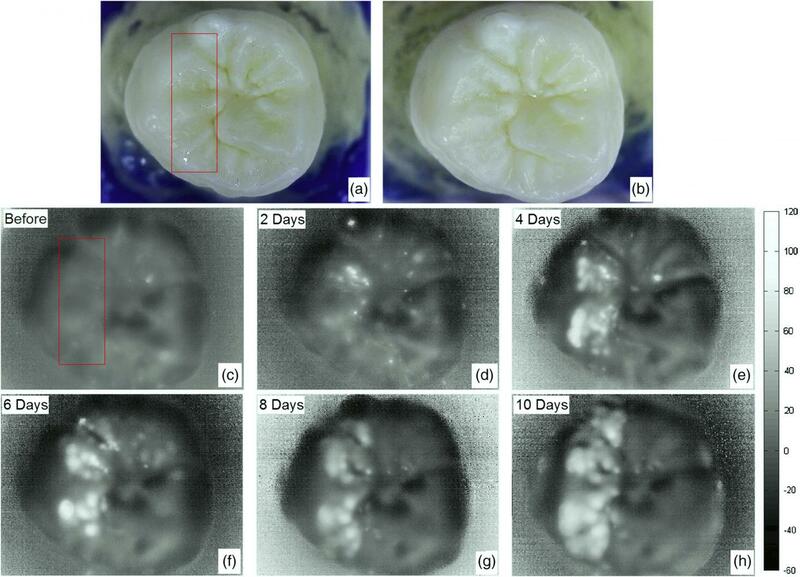 To test the effectiveness of this new imaging tool, the authors artificially induced early demineralization on an extracted human molar by submerging it in an acid solution for 2, 4, 6, 8, and 10 days. The TPLI image taken after just 2 days clearly showed the presence of a lesion, whereas a trained dental practitioner could not visually detect the same lesion even after 10 days of demineralization. Journal associate editor Andreas Mandelis, professor of mechanical and industrial engineering at the University of Toronto, said, "This paper will have a high impact on the way dentists diagnose incipient caries. The longwave IR thermophotonic imaging technology is at its nascent steps, but this paper brings it closer to actual clinical practice." Lihong Wang, Gene K. Beare Distinguished Professor of Biomedical Engineering at Washington University in St. Louis, is editor-in-chief of the Journal of Biomedical Optics. The journal is published in print and digitally in the SPIE Digital Library, which contains more than 450,000 articles from SPIE journals, proceedings, and books, with approximately 18,000 new research papers added each year.